There are currently 4 users and 1600 guests online. Please make welcome our new Site Sponsor - Southside Boating and Fishing. The team are currently setting up a new webpage, but can be contacted at the below in the meantime and will have a new site account setup shortly. We are an independent, family owned one stop fishing and boating shop. We specialise in deep drop fishing, soft plastic fishing, jigging, land based, game fishing and more and can cater for any budget. Our friendly staff are experienced, passionate fishermen who love what they do and are happy to assist you with any of your fishing and boating needs and wants! So come down and see us on South Street in O’Connor and check out our great range and competitive prices – mention you are a Fishwrecked member to get 10% off full priced stock. The Mackerel Islands began with a dream of fishing, fun and adventure fuelled by mateship, hard work, and business built on good old fashioned trust and handshakes. 43 years later the unique, rugged, unspoilt beauty of the string of ten islands and atolls that have become known as the Mackerel Islands still abounds. Of these ten, two islands welcome guests with accommodation, facilities and activities – Thevenard Island and Direction Island. These islands are a discontinuous extension of the Ningaloo Reef system. The coral surrounding the islands are teeming with fish and marine life including painted crayfish. The diving has been described by Nigel Marsh in Divelog Australasia Magazine as “WORLD CLASS DIVING” and is one of his “TOP TEN DIVE SITES IN AUSTRALIA”. Fishing opportunities on and around the islands include beach fishing, fly fishing, bottom fishing and game fishing. We run fishing charters from Onslow and the Mackerel Islands, which are very popular as we only take on small groups, so everyone gets plenty of time with a line in the water. 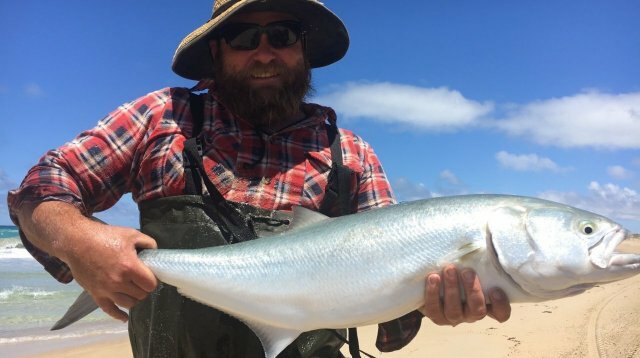 To quote Al McGlashan on his Fish’n with Mates TV Show, the fishing is “INSANE, AWESOME, lives up to its name, and the variety of fish is simply out of this world”. Thevenard Island is a major turtle habitat and hundreds of female turtles nest on the island each year. The newly hatched turtles can be seen during the summer months as they make their race down to the safety of the ocean. On the west beach, we have our own “TURTLE HIGHWAY”, a stretch of beach where visitors have a good chance of spotting a female turtle trudging to and from the dunes during nesting season. The Mackerel Islands are located 22km off the coast of Onslow, and can be reached by boat or plane. Onslow lies between Exmouth, Karratha and Karijini National Park. We offer daily transfers by boat, and also have moorings at the islands for the use of private boats. We are also really excited that Virgin Australia now flies daily from Perth to Onslow. We provide accommodation on two of the islands, Thevenard and Direction. We strive to provide knowledge, advice and gear at the lowest price. Bluewater Tackle World began as a newsagency in 1933 and has now grown into the four Bluewater Tackle World stores proudly serving the West Australian Community. We are family owned and operated, and staffed by fisherman and woman who are just as passionate about fishing as you. Whatever your fishing needs, the combined knowledge of all our staff means we have all types of fishing covered, so we will always be able to help. There is no age limit, experience required or the need to spend big to get amongst what WA has to offer. We pride ourselves on getting you out there with the knowledge and gear necessary to create some amazing memories, because for us fishing is a way of life. To give you some incentive to get out fishing this January after the ban (for the metro) and during the festive season and take some photos and put them on the site, I'm offering $200 cash to the best photo submitted to the site as voted by the members. There will be two runners up that will receive a $25 voucher each to either Oceanside or Compleat Nedlands. There will be 8 entry spots that I will choose to make the competition based on my opinion of a worthy entrant. Photos must be submitted in the month of January. I will run the competition in the first week of February (and pick up my game a little bit on previous months). All photos must be submitted as an individual image and not in forum posts. Good fishing crew and take some extra time to get that quality pic, might be worth some cash! North Coast Marine Maintenance specializes in Outboard and Sterndrive maintenance and repairs. Being Evinrude factory trained, I am equipped to diagnose and repair all Evinrude and Johnson faults as well as Suzuki, Yamaha, Honda and Mercury. Being a small business means that you can deal directly with the technician for honest reliable service. We are primarily a mobile service with no call out fee, however we also have a 200 m2 workshop for larger more technical jobs. We are able to install marine electronics, repair and fabricate boat trailers and everything in between. I am happy to give free no obligation quotes and am willing to offer $100 off annual services over winter.